3. If your FICA documents are correct and verified by our support team, your account will be activated and credited with R100 in bonus money. 4. 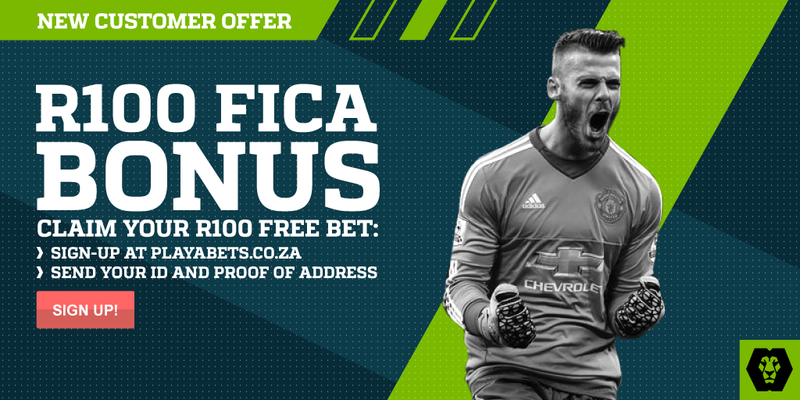 This offer is for new customers only and cannot be claimed if you receive any other promotional offer / bonus offer or if you have already placed a bet. FICA bonus cannot be used in conjuction with the 100% sign-up bonus. 1. Customers bonus money stakes are strictly NOT included in any returns or payouts. 2. Bonus money is used strictly as a “Free Bet” and does not hold monetary value. 3. All Playa offers are intended for recreational players and Playa may in its sole discretion limit the eligibility of customers to participate in all or part of any promotion. Playa reserves the right to amend, cancel, reclaim or refuse any promotion at its own discretion. 4. This offer cannot be used in conjunction with any other new customer / registration offer. 5. We reserve the right to withdraw the availability of any offer or all offers to any customer or group of customers. 6. All customer offers are limited to one per person, family, household address, email address, telephone number, same payment account number (e.g. debit or credit card, PayU, etc), and shared computer, e.g. public library or workplace. 7. Under no circumstances will a withdrawal be processed if a customer has never made a deposit. Monies won using only bonus credit or profit from bonus credit cannot be withdrawn if a customer has never made a real money deposit. 8. To qualify for a withdrawal after receiving bonus credit, your bonus credit will need to be bet once and you will need to deposit AND bet at least 3 times your bonus credit at odds of 1/1 or more. For Example, if you received R100 in bonus credit, you will need to bet bonus credit of R100 and deposit and bet R300 (R100 x 3) of real deposited money on selections of 1/1 or more before making a withdrawal. Bets taken on Lucky Numbers and bets taken on the same event DO NOT count towards the withdrawal rollover amount. Additionally, bonus funds need to be on 0 before a withdrawal can be processed. 9. Withdrawal Terms and Conditions apply. If you make a withdrawal, any existing bonus balance in your bonus account will be forfeited and your bonus balance will go to 0. 10. Bonus and Free Money Terms and Conditions apply.